This story of a simple-minded mother and daughter, born into privilege and unable to generate the income necessary for basic survival, forces us to ask dangerous questions about social responsibility. HBO Films enlisted two extraordinary actors, Jessica Lange and Drew Barrymore, to create this compelling movie, that deserves a much wider audience than what the cable channel can generate. Based on historical events, this film tells the story of Edith Bouvier Beale (Lange), aunt of Jacqueline Bouvier Kennedy/Onasis (Jeanne Tripplehorn) and her daughter, also named Edith (Barrymore). For simplicity, I’ll use the film’s reference of “Big Edie” and “Little Edie” to distinguish the two characters. Most of the movie takes place in 1975, when two filmmakers, Albert and David Maysles, filmed a documentary, called Grey Gardens, the name of the East Hampton estate, on Long Island, where the two women lived, but there are also flashbacks through their lives leading up to that time, beginning in 1936. Big Edie (Edith Bouvier, sister of John Vernou Bouvier III, Jacqueline’s father) was a lady of high society who married New York businessman Phelan Beale (Ken Howard). They settled on the Long Island estate of Grey Gardens and had several children, Little Edie being the oldest. In 1936, as a young woman, Edie decides that she wants to become an actress and singer. Although not overly talented, her energetic, bubbly personality could have carried her quite far, but both her father and mother prevented it from happening. Phelan, quite aware of her simple-minded personality, thinks that she should marry a wealthy man who can take care of her, while Big Edie wants to keep her at home at Grey Gardens, where she can help to entertain their endless parties. Big Edie is herself a singer and wants nothing more than to sip champagne, sing, and entertain. Frustrated with the way his wife throws away their money, and struggling himself in the Depression era economy, Phelan takes Little Edie to New York City, where he tries to get her to stay within her allowance and find a husband. She is more concerned with getting an audition, but falls in love with a married man, tycoon Julius Krug (Daniel Baldwin). When Phelan learns of this relationship, he forces Little Edie to return to Grey Gardens. With a big audition coming up, she drives back into the city and tries to see Julius, who becomes enraged that she might ruin his marriage. Utterly dejected, she returns to take care of her mother at Grey Gardens. Suffering from a nervous disease, exasperated by seeing her life fall apart, Little Edie loses all of her hair and takes to covering her head in scarves and blouses, creating her own unique look. Ultimately, Phelan can no longer support their lifestyle. He is disgusted by the continual round of parties and he divorces Big Edie. When he dies, he leaves her the Grey Gardens estate and a limited trust for the survival of his ex-wife and daughter. Gradually, all of their servants and friends leave until they are completely alone. The older sons urge Big Edie to sell Grey Gardens so that she and Little Edie will have enough money to live on once the trust expires, but she feels that estate is her home, all she has left, and she refuses to sell. With no one to maintain it, the estate begins to fall apart. Big Edie adopts lots of cats and raccoons wander the house picking through the trash. At last, the trust expires and there is no longer any income. Scrounging for food and without heat, the two women barely survive the harsh New York winters, listening on a little radio as Jacqueline marries John F. Kennedy, survives his assassination, and marries Aristotle Onasis. Neighbors complain about the stink emanating from the property and eventually city inspectors come to condemn the property, but the women carry on in spite of it. The attention of the city brings a photographer to the house and Little Edie invites him in to take their pictures and when the word gets out that Jacqueline’s family is living in complete poverty and filth, she comes to visit them. Fondly remembering the gay days of her aunt and cousin, she contributes the money to enable them to survive, hiring local contractors to clean up the house, fix broken windows, haul out their rusting old car, and provide for them going into the future. When the Maysles show up with the idea of doing a documentary, Little Edie embraces it as an opportunity to showcase her talents to the world. 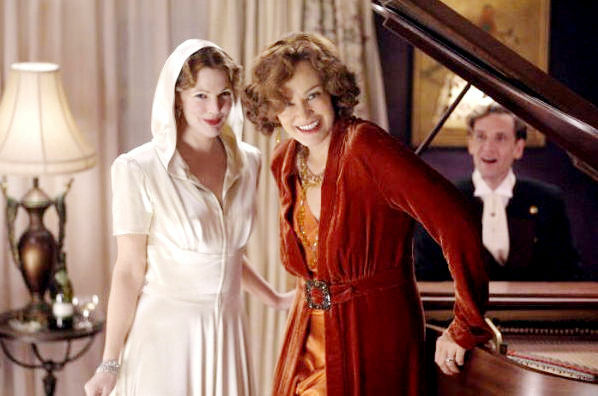 In the film, she sings and dances, argues with her mother, shows them around the property and sees a future in which she can finally escape Grey Gardens for good. Big Edie, who has depended on her daughter so long, allows Little Edie to go to the premier and finally accepts that her daughter will have to go out into the world. Directed by Michael Sucsy and written by Sucsy and Patricia Rozema, the script takes a great deal from the real lives of the two women, but especially from Little Edie. Her surviving letters and journals were used by the director to flesh out the details of her life and used very successfully in the movie. The camera is non-intrusive in the storytelling and fragments of the documentary have been recreated to great effect, intercut with the regular action. Jessica Lange is terrific as Big Edie, showing a great range as we see the character grow from a woman of around forty into her old age. A consistent and marvelous performance. However, Drew Barrymore really steals the movie. Her Little Edie, although every bit as simple-minded as her mother, is given an amazing degree of nuance that allows her to touch us with her own tragedy, yet soar with her indomitable spirit. If anyone ever doubts that Barrymore is not one of the best female actors working today, please refer them to this movie, because she carries with a brilliant performance. Nominated for 17 Emmy Awards, it won Outstanding Television Movie, Lange won for Best Actress, Howard for Best Supporting Actor, as well as winning for art direction, hair, and make-up. Both a tragedy and a comedy, this is an emotionally engaged, beautifully written and acted movie. I highly recommend it! Little Edie was the oldest, not the youngest child of Big Edie and Phelan Beale. Thank you very much for your comment. I have made the correction.